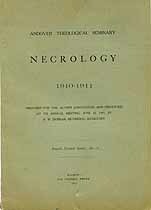 Andover Theological Seminary, Necrology, 1910-1911. Prepared for the Alumni Association and presented at its annual meeting, June 22, 1911. Fourth Printed Series, No. 1. Names in this online transcription include Balch, Bard, Bartlett, Bradford, Bullard, Clark, Crowell, Davis, Dexter, Ferris, Goodell, Hart, Jewett, Lane, Laurie, Leavitt, Lefavour, Livingston, Loomis, Mead, Pickett, Russell, Salter, Whitney, Wolcott. The Genealogy Today catalog number for this item is 13044. When inquiring about the information in this resource, please mention the catalog number.